The Dispersion Mixer is one of the two different types of Internal Mixers, with the other type more commonly known as Banbury Mixer. 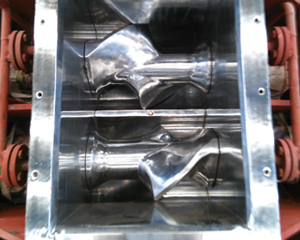 Internal Mixers are used primarily in the plastics and rubber industries. 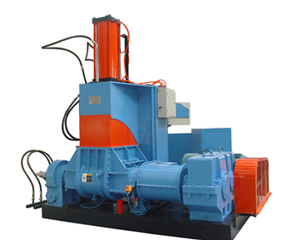 The primary difference between the two types is rotor type and discharging method. Dispersion Mixers discharge the batch by tilting the trough, while the Banbury Mixers discharge through a bottom door. Pricewise, Banbury is much more expensive than a Dispersion Mixer, with much higher power required. The DPK series Dispersion Mixers combines all the execution components on a common bed. This structure simplifies installation and can be easily re-located. In the rubber and plastics industries, the Dispersion Mixer has been recognized as one of the most commonly used mixers. The intensity of mixing action within a DPK series Dispersion Mixer achieves a uniform compound mixture with enhanced dispersion of materials. The tilting action of the DPK series Dispersion Mixer chamber makes it possible to give full access to all material contact surfaces for easy and complete cleaning. DPK series Dispersion Mixer applies special oil-less dry mechanical seals. This seal minimizes wear and material leakage as well as eliminating compound contamination with lubricating oils. The replacement of the seals is also quick and simple. NKM provides a variety of surface treatments for our DPK series Dispersion Mixer for the tough and abrasive compounds. From mixing silicones to ferrous compounds, treatments include hard chrome, Teflon, and carbide material. A Dispersion Mixer contains a W shaped chamber with a rotor in each lobe. The materials are fed through a hopper at the top, and a floating weight, or ram, drops on top of the feed to push and confine the materials to the mixing chamber, and exert extra pressure on the materials. There are two counter-rotating rotors in the chamber to provide the mixing action. The rotors turn towards each other at different speeds, and the material is sheared between the rotors and the walls. A lot of friction is generated by the rotors and heat transfer is closely controlled. Some materials can absorb the heat and give it off to the environment, but sometimes cooling method is necessary to keep a low temperature in the chamber; however, in some cases, extra heat may be added to the system. 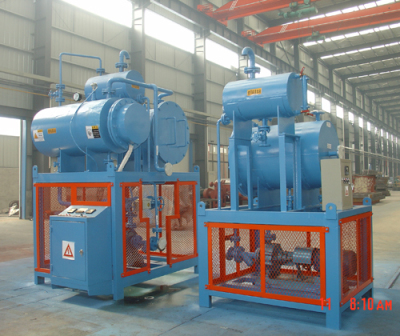 Internal pressure in the chamber can be controlled as well for vacuum or pressurized operation. This capability makes the Dispersion Mixer to act as a reactor chamber in the manufacture of many polymers. 1. 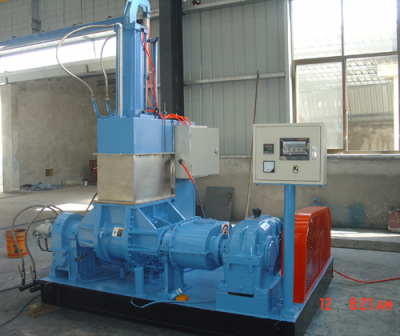 The chamber can be tilted with powered mechanism (either motorized or hydraulic operated) to discharge the materials completely (Dispersion Mixer). 2. Bottom discharging: the saddle between the rotors is attached to a discharge door at the bottom of the mixing chamber (Banbury Mixer).